FUNNVILLE - The Richmond Flying Squirrels will become Las Ardillas Voladoras de Richmond for Friday home games during the 2019 season, part of a major initiative by the club to build outreach into the Latino and Hispanic communities of the Richmond region. The details for the initiative, which is part of Minor League Baseball's Copa de la Diversión, were announced during a program at Huguenot High School on Monday morning. The fan-engagement initiative aims to educate, honor and celebrate the deeply-rooted and rich cultures of the Hispanic and Latino communities in and around Richmond. "Through this initiative, we are aiming to make the Flying Squirrels more accessible to area's Hispanic and Latino communities," Flying Squirrels VP & COO Todd "Parney" Parnell said. "This announcement helps us join others in Minor League Baseball in the wonderful Copa de la Diversión endeavor, and we will take it full-speed. We look forward to making an impact through this initiative not only on Friday nights at the ballpark, but in and around the community seven days and nights a week." For each of the team's 11 Friday home games in 2019, the Flying Squirrels will don the alternate identity of Ardillas Voladoras with an entirely new green and blue logo set and uniform set. The identity concept, which was designed by Flying Squirrels' Creative Services & Production Manager Nick Elder, is built around a lucha libre wrestling and the masked luchador, tied in with the team's original Flying Squirrels brand first introduced in 2009. The uniforms were modeled by members of the Huguenot High School baseball and softball teams during the unveiling on Monday. During Monday morning's unveiling presentation, the team also introduced Nutzy in his lucha libre uniform, which he will don for each Friday home game throughout the upcoming season. The ballpark experience at The Diamond on the Copa de la Diversión nights will include Latin and Hispanic pregame entertainment, themed in-game contests, music, specialty food items and more. The Flying Squirrels are partnering with the Virginia Hispanic Chamber of Commerce for guidance in the initiative and to further build community outreach opportunities, and with the Virginia Hispanic Foundation to help develop educational programs for the Latino and Hispanic communities in the area. 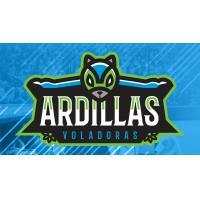 Two teams from Lakeside Youth Baseball will be playing under the Ardillas Voladoras name this spring with caps and jerseys donated by the Flying Squirrels. The Flying Squirrels also launched a full dual-language website - www.ArdillasVoladoras.com - where fans can buy tickets for the Copa de la Diversión games, view the associated promotions and more. Adrillas Voladoras merchandise, including caps, hats, T-shirts and more, is now available at the Squirrels Nest Team Store presented by Retro Brand and online at squirrelsbaseball.com. "This program will be a game-changer both at and away from The Diamond in many aspects," Parney said. "It is congruent with the Squirrels' philosophy of having FUNN, being DIFFERENT and being IMPACTFUL." The Ardillas Voladoras identity will debut on Friday, April 5 against the Hartford Yard Goats, who will be donning their Los Chivos de Hartford Copa de la Diversión identify for that game. The Flying Squirrels will also bring the Ardillas Voladoras identity to Hartford's Dunkin Donuts Park on April 16 and July 15, and Hartford will return Los Chivos to The Diamond on June 28. Additionally, kids run the bases following every Friday home game presented by Richmond Family Magazine. Friday's also feature the Friday Happy Hour with drink specials from 6-8 p.m., including $2 12-ounce domestic beers in all concession stands, Beer Express carts and The Thirsty Acorn as well as $2 fountain sodas at the Pepsi Fountain. The identity is part of Minor League Baseball's "Copa de la Diversión," or "Fun Cup," a season-long event specifically designed to embrace the culture and values that resonate most with participating teams' local Hispanic and Latino communities. The initiative aims to increase awareness, authentic engagements and amplify MiLB's continuous effort to diversify the game and business of baseball nationwide. The Flying Squirrels begin the 2019 season on Thursday, April 4 at The Diamond against the Hartford Yard Goats with LIT! Dueling Fireworks and a special appearance by former MLB star Ryan Klesko. Tickets are on sale now at the Flying Squirrels ticket office, online at squirrelsbaseball.com or by phone at 804-359-FUNN (3866).